These tools are used to track your site rankings in the SERPs for important keywords, tracking that information against competing sites to gauge SEO effectiveness. * Note: search rankings are not the only measure of success. If you, like me, logged onto Facebook to share photos of a trip, brag about the basketball score or add a new city to your visit list, you may have helped bring about a new era in social networking … Facebook for the first time had more traffic than Google on a weekly basis in America. 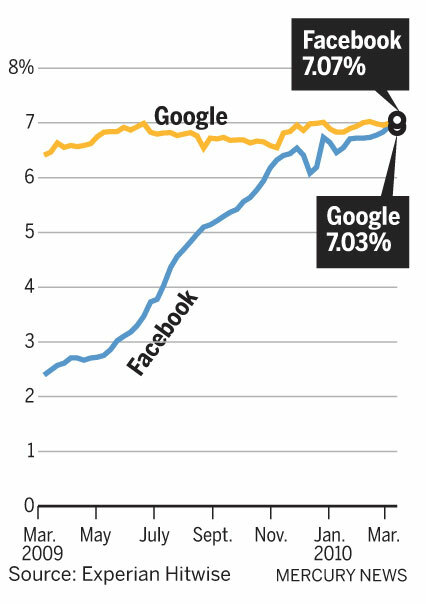 The margin between the two giants of the internet was razor thin. For the week ending March 13, visits to Facebook.com accounted for 7.07% of all Internet traffic in the United States, according to Experian Hitwise, a company that measures online traffic. Visits to search engine Google made up 7.03%. Facebook now has a recorded total of more than 400 million active users. The site has “been on a steady march for a while, on their way to becoming the top site,” said Hitwise spokesman Matt Tatham. Jeremiah Owyang, an analyst at the Altimeter Group in San Mateo and author of the blog Web Strategy, said the shift in traffic is important. “The key trend to think about here is people are spending more time talking to and interacting with each other. This does impact Google because people may be making decisions by listening and talking to each other rather than using traditional search avenues.” He said rising interest in games such as “FarmVille,” which many users play via the Facebook site, also may be contributing to Facebook’s traffic increases. Search Engine Optomization [SEO] has become an essential weapon in the arsenal of online business. 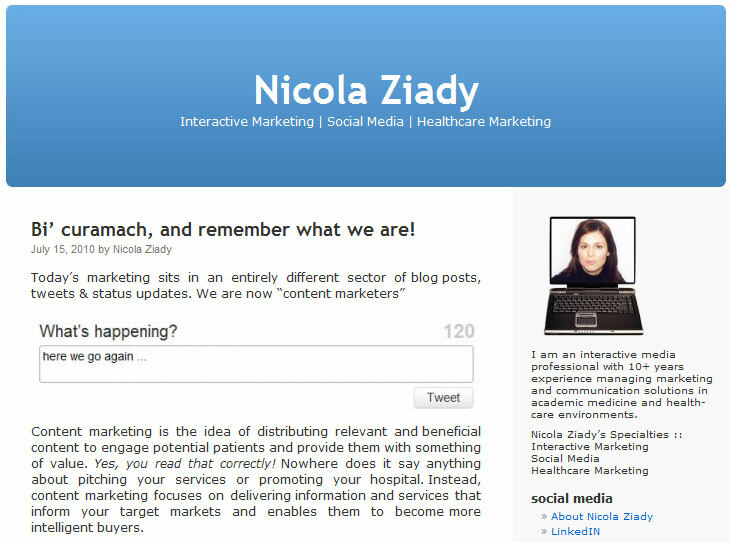 Unfortunately for most healthcare marketers it also somewhat of an enigma! This is due party to the fact that the field is new and changing rapidly and also the fact that SEO experts tends to speak a language unknown to lay marketers! algorithm :: A complex mathematical formula used by search engines to assess the relevance and importance of websites and rank them accordingly in their search results. These algorithms are kept tightly under wraps as they are the key to the objectivity of search engines (i.e. the algorithm ensures relevant results, and relevant results bring more users, which in turn brings more advertising revenue). backlink :: A text link to your website from another website. crawl :: Google finds pages on the World Wide Web and records their details in its index by sending out \u2018spiders\u2019 or \u2018robots\u2019. These spiders make their way from page to page and site to site by following text links. To a spider, a text link is like a door. domain name :: The virtual address of your website (normally in the form http://www.yourbusinessname.com). This is what people will type when they want to visit your site. It is also what you will use as the address in any text links back to your site. Flash :: A technology used to create animated web pages. Google :: The search engine with the greatest coverage of the World Wide Web, and which is responsible for most search engine-referred traffic. Of approximately 11.5 billion pages on the World Wide Web, it is estimated that Google has indexed around 8.8 billion. This is one reason why it takes so long to increase your ranking! Google PageRank :: How Google scores a website\u2019s importance. It gives all sites a mark out of 10.
keyword :: A word which your customers search for and which you use frequently on your site in order to be relevant to those searches. This use known as targeting a keyword. Most websites actually target \u2018keyword phrases\u2019 because single keywords are too generic and it is very difficult to rank highly for them. keyword density :: A measure of the frequency of your keyword in relation to the total wordcount of the page. So if your page has 200 words, and your keyword phrase appears 10 times, its density is 5%. keyword phrase :: A phrase which your customers search for and which you use frequently on your site in order to be relevant to those searches. link :: A word or image on a web page which the reader can click to visit another page. There are normally visual cues to indicate to the reader that the word or image is a link. link path :: Using text links to connect a series of page (i.e. page 1 connects to page 2, page 2 connects to page 3, page 3 connects to page 4, and so on). Search engine \u2018spiders\u2019 and \u2018robots\u2019 use text links to jump from page to page as they gather information about it, so it\u2019s a good idea to allow them traverse your entire site via text links. link popularity :: The number of links to your website. Link popularity is the single most important factor in a high search engine ranking. Webmasters use a number of methods to increase their site’s link popularity including article PR, link exchange (link partners / reciprocal linking), link buying, and link directories. link text :: The part of a text link that is visible to the reader. When generating links to your own site, they are most effective (in terms of ranking) if they include your keyword. meta tag :: A short note within the header of the HTML of your web page which describes some aspect of that page. These meta tags are read by the search engines and used to help assess the relevance of a site to a particular search. natural search results :: The \u2018real\u2019 search results. The results that most users are looking for and which take up most of the window. For most searches, the search engine displays a long list of links to sites with content which is related to the word you searched for. These results are ranked according to how relevant and important they are. rank :: Your position in the search results that display when someone searches for a particular word at a search engine. robots.txt file :: A file which is used to inform the search engine spider which pages on a site should not be indexed. This file sits in your site\u2019s root directory on the web server. (Alternatively, you can do a similar thing by placing tags in the header section of your HTML for search engine robots/spiders to read. Sandbox :: Many SEO experts believe that Google \u2018sandboxes\u2019 new websites. Whenever it detects a new website, it withholds its rightful ranking for a period while it determines whether your site is a genuine, credible, long term site. It does this to discourage the creation of SPAM websites (sites which serve no useful purpose other than to boost the ranking of some other site). Likewise, if Google detects a sudden increase (i.e. many hundreds or thousands) in the number of links back to your site, it may sandbox them for a period (or in fact penalize you by lowering your ranking or blacklisting your site altogether). search engine :: A search engine is an online tool which allows you to search for websites which contain a particular word or phrase. The most well known search engines are Google, Yahoo, and MSN. site map :: A single page which contains a list of text links to every page in the site (and every page contains a text link back to the site map). Think of your site map as being at the center of a spider-web. Mashable reported that search giant Google is adding to its empire through acquisition by purchasing social search engine Aardvark. Google told the online site that it’s “signed an agreement to acquire Aardvark but don’t have any additional details to report at this time,” although Tech Crunch valued the deal at $50 million. Aardvark has deep ties to Google thanks to founders and former Google executives Max Ventilla and Nathan Stoll. The company had raised $6 million in venture capital funding for the concept, which involves getting answers to questions from social distribution channels. Mashable describes Aardvark as “very much like an alternative search engine that puts your social circle to work” by taking questions and filtering it to friends through social channels, email and IM to get the best possible answers. A recent research report by Aardvark claimed that the service had a little more than 90,000 users, with the majority of people using the site on mobile platforms. Mashable speculates that Google might be interested in the Aardvark database of questions and answers as it attempts to better understand how people search for items on the Internet, or it could be tied into the recent Google Social Search experiment from Google Labs. “We’re very impressed with the Picnik team and the product they’ve created, and we’re excited to welcome them to Google,” wrote Brian Axe, Produce Management Director at Google. Americans conducted 15.4 billion core searches in March 2010, up seven percent from February, according to recent data from comScore. Google Sites came in first place accounting for 65% search market share, down slightly from 65% in February. Yahoo! Sites came in second place with 16% of the market share, followed by Microsoft Sites (11%), Ask Network (3%) and AOL LLC (2%). Although trailing far behind Google Sites, Yahoo! Sites saw a one point increase in market share from the previous month, while Microsoft Sites jumped two points from 11% in February. In the March analysis of the top properties where search activity is observed, Google Sites came in first place with 14.3 billion search queries. According to comScore, Facebook experienced significant growth during March 2010 with a 48 percent increase from February, jumping one position in the ranking. According to a report in the San Jose Mercury News, the search giant saw revenues increase by 23 percent in the first quarter of 2010 over last year while also increasing the size of their work force by four percent since the start of the year. While the revenue increases are not at the level of 40 percent growth routinely seen in the past, it does reverse a trend of declining revenues which started at the beginning of 2009. Google says that larger advertisers are returning to online spending “in droves” as the economy appears to have weathered the worst effects of the recent recession. Pichette also said that the company plans to continue investing heavily in “people, products and acquisitions” through the rest of 2010.